As part of the Comic-Con hype-cycle for Disney's Tron Legacy, which takes us back to the video game world of Tron next year, the company built a replica of Flynn's Arcade in San Diego's Gaslamp District. It was awesome. Featuring a few dozen playable, perfectly preserved arcade games, a playable Space Paranoids—the fictional arcade game featured in the original Tron—and a totally sweet lightcycle from Tron Legacy, tucked away in a secret location. 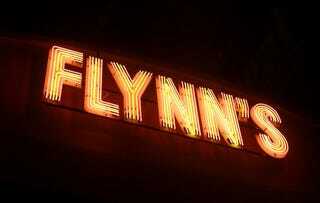 The neon light work in Flynn's was fantastic, featuring signs for a handful of featured games, like Tron and Space Paranoids. The line-up of games was so choice. I played Berzerk and Galaxian, but the list of games ran from Paperboy to Space Invaders to Off Road, a mix of (mostly) 80s era games. Here's the Space Paranoids cabinet, one of the most popular titles at Flynn's. Space Paranoids has the player control a tank with a joystick and trackball, fending off hovering Recognizers that have no problem stomping you into oblivion. It wasn't easy. Here's a close up shot of Space Paranoids in action. The Flynn's Arcade set up had re-purposed the Tron movie poster into a promo poster for the game. From Encom, the makers of Space Paranoids, comes Tron. At one point, the lights started to flicker, the jukebox started to cut out, and a hidden door opened up behind the Tron cabinet. The music changed from Billy Squire and Journey type tunes to something a bit more Daft Punk-like. We were led into a dark hallway, featuring concept art for the lightcycles in Tron Legacy. Then we saw the real thing, rotating slowly on a turntable, protected by security guards. We took a lot of pictures of the thing. Too many probably.